The Signature Frame Rack is our traditional frame rack model. It provides everything you need to examine and repair vehicles efficiently and safely, and in turn, increase productivity. This model resembles traditional frame machines that technicians are familiar with, so training to use the Signature frame rack is simple. The Signature frame machine is available in three, four, or five tower configurations. The hand held remote that controls the Signature's centralized hydraulic system is connected by 25 feet of cord to increase mobility, allowing the technician to move freely and fully examine while repairing. The Signature frame machine features 20 foot treadways and 7ft 4in total bed width, allowing technicians to work on a wide variety of vehicle widths. The three tower Signature weighs 7,050 lbs, the four tower weights 7,650 lbs, and the five tower weighs 8,100 lbs. The Signature frame rack is proudly made in the U.S.A.
Why Upgrade To Signature Hybrid Frame Machines? 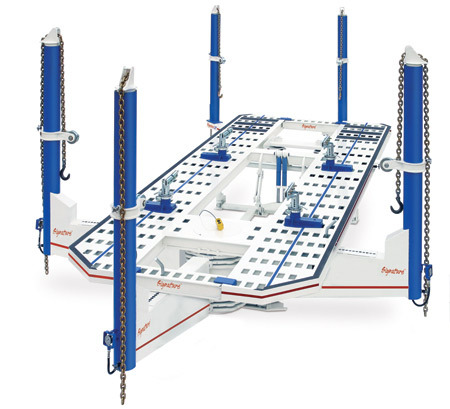 Some frame machines offer strength but insufficient tower mobility. Others have movable towers but not enough pulling power or the ability to work on wider vehicles.The Signature Hybrid has solved these challenges with an auto body frame rack that combines power, precision and all-around access. So you and your team no longer have to sacrifice one for the other. • 10-ton hydraulics in all towers provides the pulling power. • Movable towers make group pulls possible. • 360-degree access, less dead zones. • Comes with 2 or 3 movable towers, your choice. • V-rollers allow smooth, one-handed positioning of towers along track. • Easy tie-down system secures track towers for pulling. • Removable cross members allow access to front and rear of vehicle. • Ability to group towers at drive-on end. • Hydraulic quick connections on frame rack bed, 2 per side. 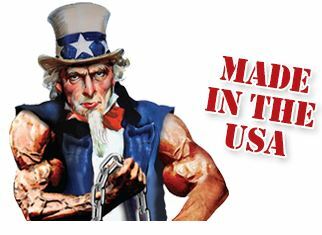 • Signature Hybrid frame machines are made in the USA. The Signature Hybrid Frame Rack combines the best features of the Signature 5-tower rack and the American Freedom 3-tower rack. The Signature frame straightener is limited to lighter pulls, because two of the five towers must be lowered so vehicles can be driven on and off the rack. The American Freedom frame rack has three mobile towers that can be rotated freely around the outside perimeter of the frame rack, which increases the versatility and improves the ease of repairs for the technicians, but limits the width of the cars it is able to withstand. The purpose of the Signature Hybrid model is to combine the versatility of the width of cars the Signature frame rack can hold with the increased pulling power of the American Freedom frame rack, enhancing the all-around efficiency of the Signature Hybrid Frame Rack. The Signature’s 10,000-pound lift capacity is supported by both the ram's steel construction and the lifting power of dual hydraulic rams. A hand-held unit on 25 feet of cord controls the Signature’s centralized hydraulic system. Available in 3 tower, 4 tower, and 5 tower configurations. Please call to designate configurations. Length of bed top: 20 ft. Length w/towers extended: (5 tower machine) 24 ft. 3 in. Width of bed: 88 in. Width w/towers extended: 14 ft. 4 in. Width of treadway: 28 in. Weight: 5 tower 8,100 lbs., 4 tower 7,650 lbs., 3 tower 7,050 lbs. Width between treadways: 32 in. Overall height: 9 ft. 3 in. Click the button below to add the Signature 20' Five Tower Frame Machine to your wish list.